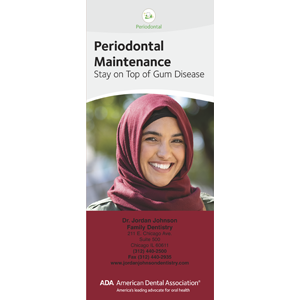 This brochure explains why periodontal maintenance is different from routine dental cleanings. Emphasizes that professional help is vital to control periodontal disease but the patient must also commit to an excellent oral care routine at home. Explains how regular periodontal cleanings reduce bacteria and help pockets shrink. Touches on the oral-systemic connection and cautions against tobacco use. New probing illustrations and before-and-after photos of periodontal treatment! 8 panels. Minimum order 150. Click Add to Cart then personalize for free. Now you can add personalized information on the front, back, or both covers on all brochures.